Tens of thousands of Haitians took to the streets Jan. 22 to protest the scheduled second round of corrupt presidential elections. The demonstrators could hardly contain their glee when word spread that it had been canceled. They had defied both the vicious brutality of the cops and the “assurances” of U.S. diplomats that the first round had been fair. 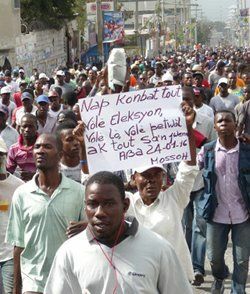 Protests were held throughout the country, the largest of them in Haiti’s capital, Port-au-Prince. The Provisional Electoral Council (CEP) canceled the round without setting a new date. The protesters raised new demands on Jan. 24. They now want President Michel Martelly to leave office immediately, even before his term ends on Feb. 7. Fanmi Lavalas, a progressive mass party in Haiti whose leader is former President Jean-Bertrand Aristide, called the decision of the CEP a victory for democracy and the Haitian people. The electoral council has been openly tied to the United States and the so-called “core” group of France, Canada, the Organization of American States, the United Nations and the European Union. Fanmi Lavalas said in a statement on its Facebook page Jan. 23 that it will continue to support struggles throughout the country. The march on Jan. 22 went along the Delmas Road from the poorest neighborhoods of Port-au-Prince to Petionville, where many of the rich and powerful live in sumptuous luxury. It then flowed back to the Champ de Mars, a large space in the center of Port-au-Prince. The march was shadowed by the Company for Intervention and the Maintenance of Order of the National Police. CIMO is Haiti’s heavily armed national SWAT team, but that day it limited itself to firing in the air and using tear gas. The protesters were so charged up that when CIMO personnel carriers pushed through the crowds, they pushed back, according to videos circulating on Facebook. The Argentine Solidarity Committee issued a call the same day, noting, “The Haitian people are in a critical battle at this moment fighting for sovereignty and the right of self-determination.” What makes this especially important is that Argentinian soldiers make up a significant portion of Minustah. There are two contending political positions in the Haitian opposition over how to resolve this electoral crisis. There is no support for extending Martelly’s term after Feb. 7. It is not going to be possible to organize elections before he is gone, and there are grave doubts about the fairness and validity of the parliamentary elections, even though the Haitian Parliament is meeting. Jovenel Moïse, the candidate for Martelly’s PHTK party and his imperialist backers like the U.N., the Core Group and the U.S., would like a brief, cleaned-up and widely accepted second round against Jude Célestin, candidate of the Alternative League for Haitian Progress and Empowerment (LAPEH). These two candidates came in first and second in the “official” counts. They’ve already spent over $100 million on this election and want to be done with it. Pitit Desalin and Fanmi Lavalas, the parties that came in third and fourth in the “official” counts, take the position that the first round of the election was fraudulent. They want to repeat the whole election cycle, including parliamentary elections, where there were also serious problems. Some political currents in this camp feel it is impossible to have fair and free elections when the country is militarily occupied by the U.N.’s Minustah troops. During this very sharp and serious struggle over the political direction of Haiti, its economy is tottering. The neighboring Dominican Republic has expelled 129,000 people because they are Haitians or the children of Haitians. They have been cooped up in totally dilapidated, nearly waterless camps on the border. Many spent their lives in the DR and are more comfortable speaking Spanish than Creole. Currently only 13 percent of Haiti’s workforce is in formal, regular jobs. Its economy, never fully recovered from the earthquake of six years ago and in bad shape before the earthquake, is being squeezed by global austerity. Since their revolution against French colonial rule more than two centuries ago, the Haitian people have never stopped struggling as hard as they can for real independence. 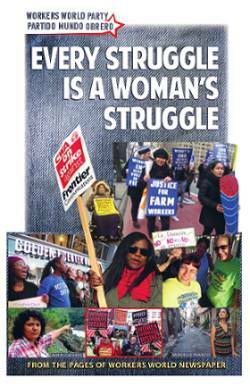 Their struggle deserves our support.